The European–Russian rover that will search for life on Mars has been named after British chemist and DNA double helix co-discoverer Rosalind Franklin. Franklin’s name was chosen from over 36,000 suggestions submitted by citizens from the European Space Agency’s 22 member states. In 1952, the x-ray crystallographer took an image nicknamed Photo 51 that was crucial evidence in the discovery that DNA has a double helix structure. The six-wheeled vehicle is currently being built at Airbus’s Mars Yard in Stevenage, UK. 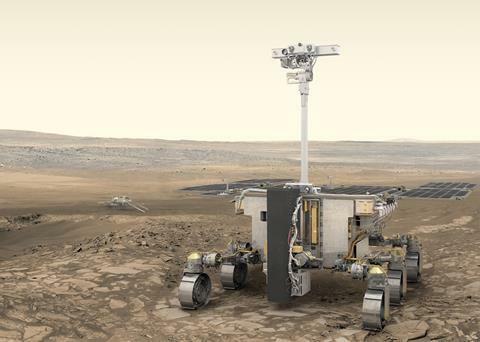 Once it is launched in July 2020, the rover will carry 26kg of scientific equipment, including a Raman spectrometer, an infrared microscope and a ground-penetrating radar. A core drill will allow it to take soil samples from up to 2m below the surface. The Franklin rover will land near Mars’s equator, on a plain rich in 3.9-billion-year-old clay thought to be the remnants of an ancient river delta. Its largest instrument, the Mars Organic Molecule Analyzer, will be looking for compounds associated with past or present life using four gas chromatography–mass spectrometry columns.